Adorable is easily one of the many adjectives that you can use to describe Colorblind by Siera Maley. This book is at times distressing all the while being heartwarming as well. I know, what a conundrum, but a glorious one at that. This book is a balancing act of sad and happy, no worries, though. You want to read this one. For any sadness that seeps out, there is a magnificent ray of sunshine that will definitely make you smile. Harper is cynical, jaded, broody with a perpetual dark cloud over her head. Give her a chance, though, Harper isn’t just any teenager. This seventeen-year-old has a special gift, that can only be seen as really a curse. She sees the age of death written on the forehead of each person she meets. In the way that you and I see the date of expiration on a gallon of milk, Harper sees these hundreds of times a day on people. Can you imagine how awful this would be, seeing a toddling two-year-old and seeing the number 4, or a young mother and seeing a 37? Heartwrenching! Harper knows that no one would understand, and basically think that see had seriously lost her marbles if she told anyone. Chloe Stephens is in one word, magnetic. This character is one of those people that, you know the type that everyone is naturally drawn to. They exude fun and kindness and you cannot help but love’em. She has the wisdom of ninety-year-old, with the adventurous spirit that only teenagers have and exuding positivity all along the way. These two meet by chance, Chloe just moving into Harper’s San Francisco neighborhood, and become fast friends. Harper is super reluctant to allow Chloe into her life, but the charming spirit of Chloe is just too much to ignore. Chloe doesn’t beat around the bush either. She lets Harper know in no uncertain terms that she is interested in a relationship because she’s cute and interesting. This was so refreshing. No long pining away, Chloe knows how to communicate! The book is with Chloe and Harper carving out their friendship and then their romance. It’s cute and fun, Chloe makes Harper see the fun side of life and let go of her constant doom and gloom broodiness. If you haven’t read this book, you might be wondering, Can Harper see Chloe’s number? The answer is yes, she totally can, and that my friend adds to the angst of the story. Overall, this book is fantastic. 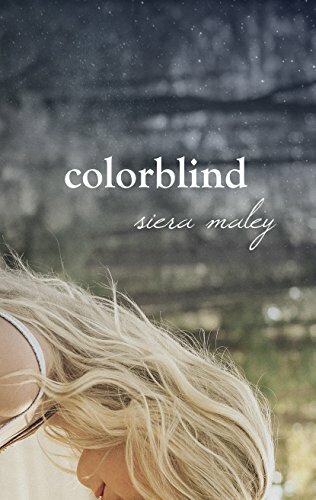 I have enjoyed each of Siera Maley’s books, but Colorblind is easily the best of her work. The book has just enough tension to keep you on edge, and when it’s finally time for the conclusion, Maley does a masterful job of finishing this delightful book. Highly recommend!